My name is Julia Stege, the Magical Marketer, and I’ve come into your life to let you know: you can’t hide any longer. You know you have an important message, product, or service that will make the world a better place. That kind of marketing just isn’t a match for your personality and message, and anyway, you can’t stomach it long enough to give it a try. Maybe you have felt like giving up on marketing altogether, but I want to tell you there’s another way, a whole new paradigm for marketing that comes from the heart, promotes what’s most important to you, and attracts your most perfect customers. but can’t find a marketing method you like that also works? but you have no clue how to use them for your business? Does any of the following sound so familiar it makes you sick? You know there’s something BIG missing from your marketing plan, but you just can’t put your finger on what it is. You’ve been fascinated by alternative teachings like the Law of Attraction and other spiritual principles, but haven’t figured out how to integrate them into your marketing efforts. You’ve been embarrased by your marketing (or lack of it) because it doesn’t really reflect who you are. So you don’t like to show people your stuff, and you know you’re losing sales as a result. You started your business by attracting customers through referrals and networking, but that’s not working as well as it used to. You’ve been told so many things by marketing efforts that you don’t know which is the best next step for YOU. You wish you had a marketing plan that was fun and fulfilling as well as attractive and effective! You have been taking every customer who shows you the money, but a lot of the time you find yourself wasting time with people who don’t get you or your value. And most importantly, you know that what you have to offer will make the lives of countless others so much better, if you only knew how to get the word out at the right time in the right places with the right words to attract the right people who really want and need your unique gifts. you, because you are aligned? The very opposite of hype is what makes you tick, your true life passion. It’s when you share that in your marketing that everything starts to click. Your message, your visuals, your marketing, your programs and products all come together cohesively as a true reflection of you. As a sensitive intuitive myself, I have always had a knack for seeing the beauty and magic in others and bringing that out to the light. Now I want to teach you how to create a fun, fulfilling and attractive marketing plan that will create a client attraction breakthrough for you while being your authentic self. “Since attending Julia’s classes “Client Attraction Breakthrough” and her social networking course several months ago, my business has grown 30% and this month it will be 50%. I am attracting more business than ever, and Yipee! I get to be me through the whole process! The success results are dramatic for me. Enthusiasm is key and Julia pointed the direction. “During Julia’s Social Networking classes I had created a Blogger blog, a WordPress blog and a Hubpages hub, and got to page one of Google. Now, lo and behold I have 2 page one positions out of over 2.6 million on Google when the search is for “leasing lawyer” which is just what I am and want to promote. 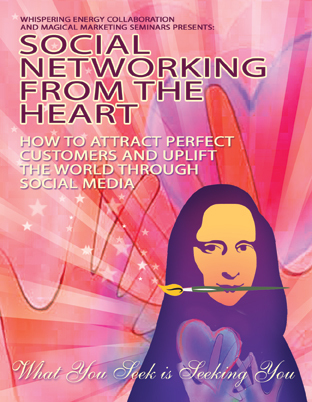 A Webinar Intensive to create a fun and fulfilling Social Networking plan that attracts perfect customers while you uplift the world. Learn the latest strategies on networks like Twitter, Facebook and Linked In while discovering magical ways to get to page one of Google just by sharing yourself authentically. You will develop a do-able plan for expanding your networks with people who are a perfect match for your offering, all the while sharing your purpose with the world. 6 x Video Trainings on How to Set Up and Use Social Networks likeTwitter, Facebook, and also authority sites that get you to page one of Google. Looking forward to helping you finally create an online marketing plan that is fun, fulfilling and sustainable for you! PS: If you have been avoiding marketing because you feel alienated from the process, think about how many clients you are losing to the cosmos! If you have any questions about whether any of my courses are for you, please do not hesitate to call me at (707) 823-3316 and I’ll be happy to answer your questions.